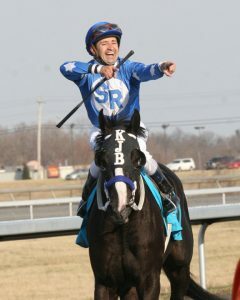 There is perhaps no more famous jockey on the East Coast racing circuit than Joe Bravo. Nicknamed “Ace” for his expert riding skills, Bravo has been a dominant factor in horse racing for many years. He is especially good at the Monmouth race track in New Jersey. Many trainers turn to Joe Bravo when they have a horse who needs an expert ride in a stakes race. Joe Bravo was born in Long Branch, New Jersey. Long Branch is known for being horse country. Rock music legend Bruce Springsteen settled his own family there so that his daughter Jessica could train to become an equestrian. The young Bravo was introduced to thoroughbred horse racing early in life. His father and grandfather were also both jockeys. When Bravo finished his initial training as a jockey, he decided to leave the state of New Jersey to make a name for himself in Florida. Bravo headed south in 1988 and began riding his first mounts at Calder Race Course in Miami, Florida. He was moderately successful from the start, but it wasn’t until he returned home in the 1990s that the career of Joe Bravo began to ascend. Bravo targeted the two primary race tracks in New Jersey at that time. He made the Meadowlands Race Track and Monmouth his home base. The young jockey gained the attention of trainers because of his patient hand with horses. He also became a specialist on the tracks in his home state, and trainers that shipped their horses in from other locations would often seek out his services. Nine times Bravo was the leading rider at the Meadowlands. He claimed the Monmouth riding title an amazing 13 times. This is quite an accomplishment when you consider that Monmouth has always had a strong jockey colony. The riders Bravo competed against on a regular basis included Gary Stevens, Edgar Prado, and female jockey Julie Krone. Bravo gained national attention by riding Formal Gold in 1997 to multiple victories. From 2004 through 2006 Bravo won the Jersey Shore Breeders’ Cup Stakes three times in a row. He has claimed the race five times in total. Today, Bravo still maintains a home in New Jersey. He also has a home in Florida where he stays during the winter months so that he can compete on the Florida circuit. Bravo has won more than 5,000 races in his career and is still going strong. Today he can be found competing in some of racing’s biggest events, and he is a fixture each year at the Breeders’ Cup World Championships. Ask other jockeys in horse racing and you’ll soon discover than Joe Bravo is a well-liked personality. He has an easy-going demeanor that is respected by his fellow horsemen. In 2018, Bravo became a goodwill ambassador for the charity event Jockeys and Jeans. The event is conducted each year to help jockeys that have become permanently disabled due to horse racing accidents. The organizers of the event chose Bravo to be an ambassador because he is a caring person who believes it is important to support jockeys that have had career-ending accidents. Bravo is no stranger to the pitfalls of being a jockey. He has suffered his own spills throughout the years. Thankfully, none of those have been bad enough to permanently sideline him from racing action. The Jockeys and Jeans event is one of the leading fundraisers for disabled jockeys in the United States. As an ambassador for the program, Bravo is tasked with taking the program’s message to other race tracks throughout the United States. He will also seek the participation of horse owners and trainers across the nation, and he will assist the organization with finding venues for the event. Bravo has also competed in and won the Cowdin Stakes, Donn Handicap, and the Haskell Invitational in 2004. The Haskell is considered to be one of the most important stakes races in the United States, and it typically draws horses that have competed in the Triple Crown series. Would you like to watch and wager on Joe Bravo? All you need to do is create an account with one of our recommended online racebooks. You can start betting the horses online today right from your computer, phone, or tablet.